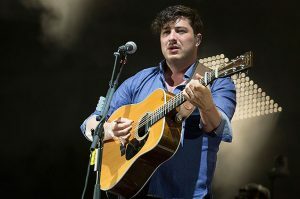 Famed musician and Mumford & Sons front-man Marcus Mumford has spoken up about his faith, saying, ‘I really love Jesus. I always have and I always will’. Mumford made his comments while hosting an interview at Holy Trinity Brompton’s annual leadership conference earlier this month. Introducing himself, Mumford, who has spoken about his ambiguous relationship with ‘Christianity’ before, said: ‘I really love Jesus. I always have and I always will. ‘I feel we live in a time of heightened hostility, whether it’s in the increasingly divisive political atmosphere here in the west, or the more catastrophic human disasters and conflicts further east and south of us. Mumford was interviewing Mrs Marouba Tatiana Viviane Nee Bangue, the director of Femme Homme Action Plus, a group that works with victims of conflict in the Central African Republic, particularly women and children. He also spoke with Robi Damelin, an Israeli woman whose son was shot dead by a Palestinian sniper in 2002. Damelin said that when she first heard the news of her son’s death, she instinctively responded: ‘Do not take revenge in the name of my son’. She shared her story of the struggle for forgiveness and reconciliation with the man who killed her son. She implored the audience not to ‘take sides’ on the Israel/Palestine conflict. ‘If you’re pro-Israel or pro-Palestine, you’re just importing our conflict into your country, and creating hatred between Muslims and Jews. I don’t think thats what you want,’ she said. Mumford, a global ambassador for the humanitarian charity War Child, described the first time he met Robi: ‘I was another proud bolshie white guy coming into Israel and pal with ‘ideas’ and Robi said to me: “Please just listen, because when you listen you give dignity to my humanity,” and it really humbled me.